The term Intrapreneur was coined in the late 1970s in the book Intrapreneuring by Gifford Pinchot, lecturer and author. 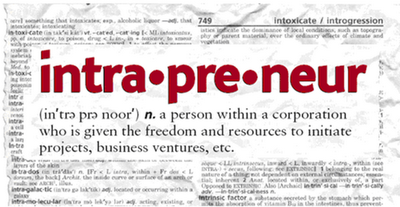 By definition, an intrapreneur is a dreamer who does. S/He takes a hands-on responsibility for creating innovation of any kind within an organization. It refers to employees who have entrepreneurial spirit but remain within the corporate structure. This internal entrepreneur has the ability to recognize opportunity, draw up a business plan and build a team to develop and implement the project. Some Intrapreneurs eventually realize metamorphosis into Entrepreneurs. Entrepreneurs were probably once Intrapreneurs that broke out on their own, after honing their skills. This blog, along with my newsletter is written for both of these very rare persons who constantly strive for excellence in business and personally. 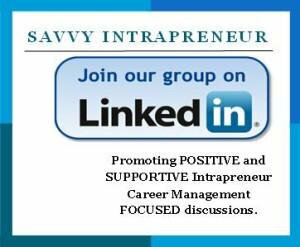 Click here to LIKE to "Savvy Intraprenuer" on Facebook. Quality innovative business articles are welcome. If you wish to tell people your story, shoot me an email for us to arrange an interview with you. Everyone has a unique story. Why not tell yours? 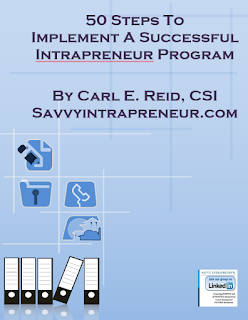 Hi Carl, this was cool .. about intrapreneurs...Keep blogging.